1. Targeting of high profile and international events by state-sponsored or other foreign adversaries, cyber criminals and issue motivated groups is a real and persistent threat. The information contained on government systems, whether classified or unclassified, is of strategic interest to cyber adversaries. Information gathered through cyber espionage can be used to gain an economic, diplomatic or political advantage. 2. There are many examples of entities being targeted due to their involvement in high profile events. In November 2012, Association of Southeast Asian Nations (ASEAN)-themed malicious emails were sent targeting Australian government agencies in an attempt to compromise their networks and obtain sensitive information. These emails appeared to come from entities associated with ASEAN events. 3. 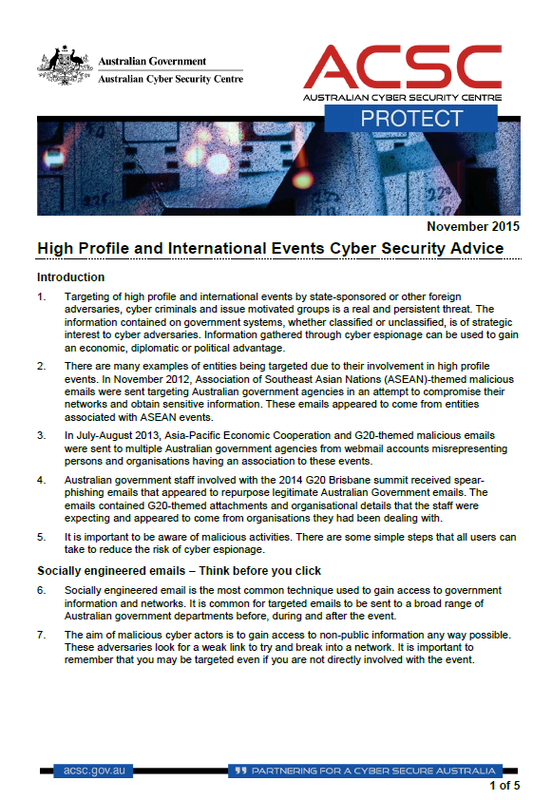 In July-August 2013, Asia-Pacific Economic Cooperation and G20-themed malicious emails were sent to multiple Australian government agencies from webmail accounts misrepresenting persons and organisations having an association to these events. 4. Australian government staff involved with the 2014 G20 Brisbane summit received spear-phishing emails that appeared to repurpose legitimate Australian Government emails. The emails contained G20-themed attachments and organisational details that the staff were expecting and appeared to come from organisations they had been dealing with. 5. It is important to be aware of malicious activities. There are some simple steps that all users can take to reduce the risk of cyber espionage. 6. Socially engineered email is the most common technique used to gain access to government information and networks. It is common for targeted emails to be sent to a broad range of Australian government departments before, during and after the event. 7. The aim of malicious cyber actors is to gain access to non-public information any way possible. These adversaries look for a weak link to try and break into a network. It is important to remember that you may be targeted even if you are not directly involved with the event. a. Is the email from a trusted source? b. Is the manner in which the email is written consistent with what you expect from the sender? c. Is the sender encouraging you to download a file, open an attachment or visit a website for further information? a. If you have any doubt about the legitimacy of an email you can check the authenticity with the sender by contacting them through alternative means (e.g. phone call or SMS). b. Never click on a link in an email. First, hover your cursor over the suspicious link to display the actual link – ensure that actual link matches the written link displayed in the email. If necessary, you should type or copy and paste the link into your internet browser. c. Be aware of unusual file types, for example .jar and .exe, and do not open them if they are not what you were expecting. c. Dialogue boxes that close before you have had a chance to read them. 11. To help ensure the legitimacy of your email communications, if available, take the option to digitally sign your emails when communicating externally as part of your official duties. If you suspect that you’ve been the target of a socially engineered email, do not delete or forward the email. Rather, contact your ICT security team immediately and provide them with the details they request. Using webmail for government business – Do you need to be mobile? 12. Web-based email (webmail) is email accessed using a web browser, such as Gmail, Hotmail or Yahoo Mail. You should avoid using webmail for when communicating official or sensitive government information. This is because webmail will bypass the security controls which your ICT security team has put in place. They will have no visibility of, or ability to protect, the information that is shared through such email accounts. 13. If you need to be mobile in support of your official duties at the high profile or international events, please discuss possible secure access solutions with your ICT security team. Removable media and mobile devices – If it’s not yours don’t use it! 14. Removable media (e.g. USB flash drives, CD/DVD disks) and mobile devices (eg. smartphones and tablets) can be inadvertently or intentionally contaminated with malicious software. 15. Gifting. It is common to receive small gifts, such as removable media in the form of a USB device from stakeholders when attending events, including those also attending these events. People with a malicious intent may use these opportunities to gift electronic devices that are preloaded with malicious software. When these devices are used or connected to an Australian government network or personal device, malicious software may install and run, which can allow the theft of official or sensitive data. 16. Gifted electronic devices should not be used, and should be handed in to ICT security staff as soon as possible. Your ICT security team has the ability to scan removable media to make certain there is no hidden malicious software. a. Do not accept complimentary or promotional removable devices. b. Do not offer or allow another unauthorised person to insert any removable media or mobile electronic device into a computer that connects to important information or any government network. c. Where possible only insert your removable media or mobile devices on trusted computers. In some cases, by inserting these devices into an unknown computer there is a chance a virus exists on that computer which could be transferred to your removable media, or vice versa. d. When charging mobile devices you should only use a trusted computer to connect to the device charger. e. Maintain physical control over your mobile devices (whether they are your own or agency-issued), not only to minimise the risk of theft or loss, but also to protect the confidentiality of information stored on the device.